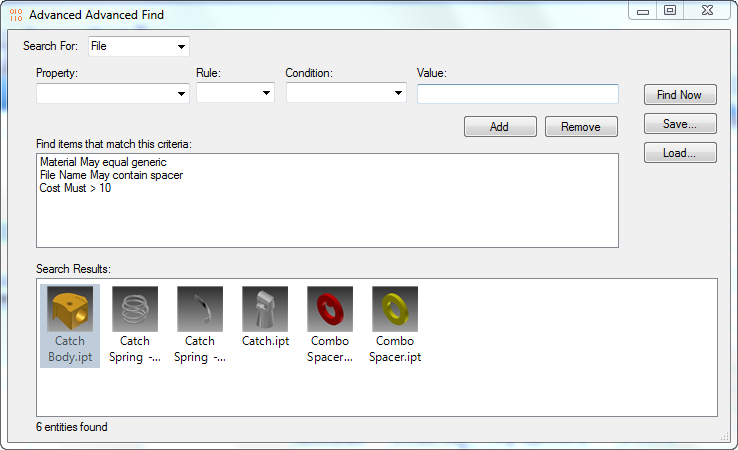 I updated Advanced Advanced Find to the 2014 release and made some improvements along the way. I briefly toyed with the idea of calling it Advanced Advanced Advanced Find, but that would just be silly. If your not familiar with the app, it works much like the advanced find feature in Vault Explorer. But my app adds the ability to do OR searches across multiple properties. Results are shown in a Vault Grid Control. Double-clicking a result closes the dialog and takes you to the object. 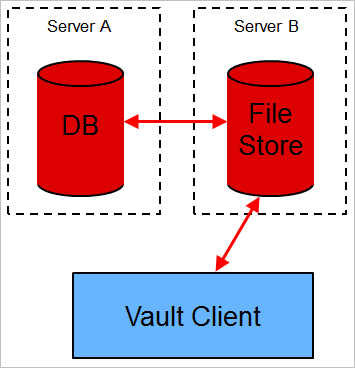 One of the major architecture changes in Vault 2014 is the filestore server. In order to explain this architecture, I need to first explain how things worked in 2013. If you had a multi-site environment in Vault 2013, it looked like this. There is a problem with this architecture, every time you need data from the database, you need to go through two hops. 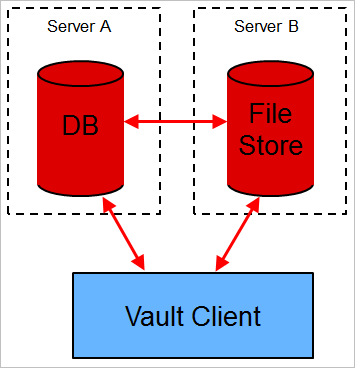 Just about everything you do in Vault requires the database, so the extra hop is significant. For Vault 2014 the architecture, was updated to look like this. DB calls go directly to the database, so it’s only one hop. That efficiency comes at a cost however. The new architecture is more complex. This architecture is always in place, even for Vault Basic and single-site installs. It’s just easier to have 1 architecture. For multi-site, a client will actually be talking to two different servers. You log-in to the filestore server. Internally the WebServiceManager or Connection object asks the filestore server where the database server is located. File upload/download operations require communicating with both servers. Again, the Connection object handles the details internally. For backward compatibility purposes, the filestore server handles all 2012 and 2013 web service calls. You need to use the 2014 API if you want the one-hop behavior. There are now two sets of server log files. vlog is for database server issues and AVFS-log is for filestore issues. Even on a single server you see these two logs. The functionality is broken down by web service. So some services are on the database server and some are on the filestore server. There are no services that show up on both, with the exception of the Information Service. The URLs are different too depending on which server you are talking too. Database services are http://[server]/autodeskDM/services/v18/[service].svc while filestore services are http://[server]/autodeskDM/services/filestore/v18/[service].svc. But you shouldn’t have to care about that if you are using WebServiceManager or Connection. Technically it’s called the VaultBrowserControl, but everyone refers to it as The Grid Control. Sure, you can build other grid controls, but there is no point. The Grid Control does everything you want. The version in the VDF is actually an improved version over the main grid in the Vault Explorer client. I can’t do justice to all the features of this control, so I bought in the developer lead on the VDF. Please give a warm internet welcome to Michael Foster. If you liked this video, please let us know in the comments section. I think I can get Michael to provide more content if we give him enough encouragement. In an effort to address some long standing Job Processor issues, some major changes were made in 2014. At the time of this writing, there are still some issues being worked on, so be sure to read the workarounds at the bottom of the post. But let’s start with the good news. In previous releases, you would have to update the XML in JobProcessor.exe.config so that it knew about your custom job types. This was an annoying extra step in deploying you plug-in. For Vault 2014, the .vcet.config format was overhauled (along with the loading mechanism for plug-ins) so it was a good time to slip in a feature that allowed Job Processor to read the job types directly from .vcet.config. The new .vcet.config allows for meta-data in the form of key/value pairs. Job processor looks for keys that start with “JobType” and associates those types with your plug-in. You can have as many types as you want, just make sure to keep the key names unique. Name your keys like “JobType1”, “JobType2”, “JobType3” and so on. interface="Autodesk.Connectivity.JobProcessor.Extensibility.IJobHandler, Autodesk.Connectivity.JobProcessor.Extensibility, Version=18.0.0.0, Culture=neutral, PublicKeyToken=aa20f34aedd220e1"
You can never be rich or have too many command line options. In 2014, you can now set username, password and server from the command line using -u, -p and -s respectively. If you are using Windows authentication, use -w.
To make JobProcessor.exe more stable, all the unstable operations were moved to a different process. All plug-ins now run in Connectivity.JobProcessor.Delegate.Host.exe, that way if a job crashes or leaks memory, the problem can be handled. And by “handled”, I mean that JobProcessor just kills the delegate process and starts another one. In fact, JobProcessor will periodically kill and restart the delegate just to be on the safe side. To debug, you need to attach to the running Connectivity.JobProcessor.Delegate.Host.exe. You can’t launch this process on your own. If you run against JobProcessor.exe, your breakpoints won’t activate. If you are saving data in memory, keep in mind that the entire process may be killed and restarted. Only one delegate exe will be running at any given time. And, jobs are still run single-threaded. So you don’t have to worry about your code running in parallel with other jobs. The OnJobProcessorStartup and OnJobProcessorShutdown events trigger on the startup and graceful shutdown of the delegate process. If there is a crash, there may not be a shutdown event. Problem: AcquireFiles hangs when running inside of a job. You may see errors like “Cannot evaluate expression because the current thread is in a sleep, wait, or join”. Cause: The VDF was initialized as a UI app, which is the default setting. We are working on a fix. Workaround: While the fix is being worked on, you can set the VDF to non-UI mode with the below line of code. It won’t hurt anything if multiple plug-ins call this code. And the code won’t harm anything after the fix is released. There is an upcoming webinar on writing apps for the Autodesk Exchange App store. In case you didn’t know already, Autodesk has an app store called Autodesk Exchange. There are “stores” for 15 products, including Vault. So it’s a great way to promote yourself, promote your company and/or make some extra cash. Open to anyone interested in publishing apps on Autodesk Exchange Apps (i.e. ADN membership is not required :-). Registration: Reserve your place by June 11 by sending an email to adn-training-worldwide@autodesk.com with Exchange Apps webinar as the subject. Please make sure you include your full name, company name and email address. If you don’t know what to build, that’s OK, I have plenty of apps you could write. That’s right, you can take one of my apps, update it for the latest Vault release, put it on the app store, and charge for it. I’m totally OK with that! It’s a win for you (extra cash from some else’s code), a win for Vault (more functionality) and a win for me (I don’t have to update the app). All I ask is that you don’t use the orange “Ones and Zeros” logo and you include your company in the name (ex. MyCo’s Hyperlink Maestro). 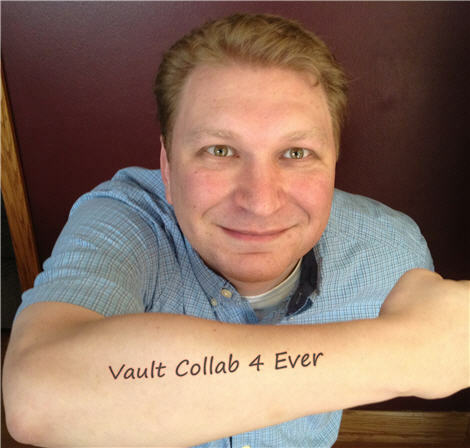 If you just got a Vault Collaboration tattoo, I’ve got bad news for you. The product is no longer there in the 2014 release. The 2014 product line consists of only Vault Basic, Workgroup and Professional. Oh well, at least my Google Reader tattoo will never go out of style. I will be focusing on the technical content, like I always do. If you have questions about pricing, support and migration, see your reseller. My understanding is that things have been adjusted to make the Collab->Pro transition as smooth as possible for existing customers. There has been no impact on the product feature sets. Vault Basic, Workgroup and Professional still have all the features they did from before. Items and Change Orders can be hidden in Vault Pro if you are not interested in those features. There are some spots in the API that still reference Vault Collaboration. The decision to remove the product was made after the API was locked down. The Vault Collab stuff should not affect the API; it should just be dormant code. If you experience any issues, let us know. My biggest problem with Vault Collaboration was that A) it didn’t have custom objects, and B) the AEC community was encouraged to use that product. As a result, the AEC customers did not have custom objects, which is one of the most powerful tools for Vault customization. With Vault Collab gone, AEC customers are being moved to Vault Professional. That means your apps can use custom objects all you want without alienating any industry group. That’s all I have on this topic. It’s pretty straightforward. Now if you’ll excuse me, I have an appointment at the laser center.